Bellevue, Washington — March 24, 2017 —T-Mobile (NASDAQ: TMUS) began rolling out Scam ID and Scam Block to customers today to safeguard them from scam calls, which cost Americans millions of dollars every year. With Scam ID, customers are automatically alerted when an incoming call is likely a scam. And, when customers enable Scam Block, T-Mobile will stop scam calls before they ever reach them. These free new customer protection features are powered by patent-pending T-Mobile technology built right into the Un-carrier’s advanced network – which also means scam blocking works on every single phone on T-Mobile’s network. Phone scams come in all shapes and sizes, from the IRS scam to Medicare cons to “free” travel to credit card scams and countless others. These phone scams are run by fraudsters who are often armed with robocalling technology enabling them to target vast numbers of people and make tens of thousands of calls a minute with the sole purpose of cheating people and separating them from their money. Here’s how it all works: every time someone calls a T-Mobile customer, as soon as that call reaches the T-Mobile network, patent-pending technology analyzes it – in milliseconds – against an advanced global database of tens of thousands of known scammer numbers. The database is kept up-to-date in near real-time by analyzing every call that comes into the network with behavioral heuristics and intelligent scam pattern detection. When a match is found, the T-Mobile network tags the incoming call and warns the customer that it’s likely from a scammer. Because of the way T-Mobile’s network manages voice traffic, the Un-carrier is capable of analyzing every call to identify and block scammers. 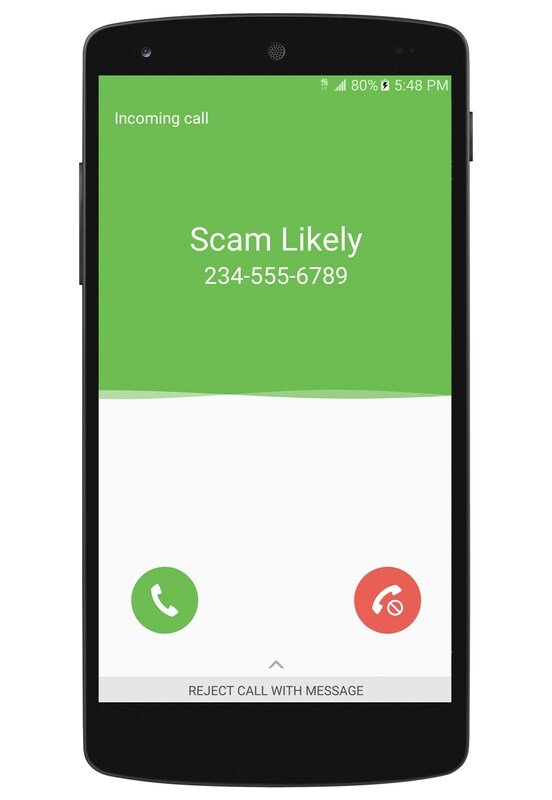 If a customer prefers never to be bothered by scam calls, they can simply turn on Scam Block, and T-Mobile will terminate the call before it ever reaches the customer – stopping the scammers cold. The customer is always in control and always has the power to decline or block scam calls. T-Mobile is part of an industry-wide effort to fight robocalling, led by Federal Communications Commission (FCC) Chairman Ajit Pai. Scam ID and Scam Block stop robocalls for T-Mobile customers in their most insidious form - phone scams. To learn more, visit www.t-mobile.com/callprotection. Enabling Scam Blocking may inadvertently block desired calls. Disable Scam Blocking at any time. Services expected to be available to MetroPCS customers later in April. Our intention is to roll out to all remaining T-Mobile customers over time. Scam Block Logo. Link to view and download the asset in the Media Library. Scam ID. Link to view and download the asset in the Media Library.